An awesome early season showdown between America’s best off-roader, Josiah Middaugh, Canada’s fastest man, Karsten Madsen, and Costa Rican star Rom Akerson will take place Sunday at Playa Reserva Conchal in Costa Rica’s northwest province of Guanacaste. Those three power-houses will be joined in the elite men’s race by Sebastian Neef from Germany, who is the reigning German long-distance national champion, home country favorite Andres Zuniga, and Americans Will Kelsay, who was 5th in the XTERRA Asia-Pacific Tour last year, Ian King, who was a top 20 performer on the Pan Am Tour last season, and Humberto Rivera, who will be making his elite debut. Middaugh won this race last year, his first XTERRA Costa Rica title in four tries following three straight runner-up performances. “Hey, that’s better than 15 tries,” he said after the race, referencing the 2015 XTERRA World Championship he won on his 15th attempt. Another man coming in hot is Madsen. 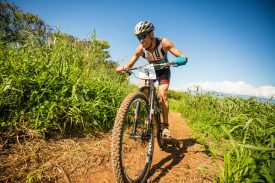 Madsen had a rough swim at XTERRA Worlds last year, felt shaky early on the bike and pulled. The DNF haunted him in the days and weeks to follow. Madsen has been training in Phoenix, Arizona since early January, which should serve him well in the heat and humidity of Guanacaste. In the women’s race local standout Adilia Jimenez, who won the overall amateur title at XTERRA Costa Rica last year and most recently finished 4th elite female at the Central American Games in Nicaragua, is hoping to take the top step in front of her family and friends. Americans Rebecca Blatt, who placed sixth at this race two years ago, and Jessie Koltz, who finished 11th on the XTERRA Pan Am Tour in 2017, are also in contention for the title. Two-time Olympian Gonzalo Tellechea is back to defend his XTERRA Argentina title in front of family and friends at Dique Ullum this Saturday. Tellechea, who hails from San Juan, had a great back-and-forth battle with fellow countryman Maxi Morales on the run before squeaking out the win by 25-seconds last year. Morales is also back to give it another go, and joins Kieran McPherson (NZL), Branden Rakita (USA), and Rafael Juriti (BRA) who all raced at XTERRA Chile last weekend. XTERRA Argentina, now in its third year, is the second of 12 stops on the 2018 XTERRA Pan America Tour. It starts with 1.5-kilometer swim in a dam full of warm water that looks out towards the snowcapped Andes in Chile, where the tour stopped last weekend. Rakita added that this year’s course has a lot more loose sand compared to last year and it can quickly grab your tire and sink if you are not paying attention. The women’s elite race will be a rematch from last week with Allison Baca shooting for two wins in two weeks, while Fabiola Corona, Carolina Nieva, and Anne-Sophie Marechal – who finished 2nd thru 4th last week – all try to move up a spot or two. While there are many reasons to love the beginning of spring, there is no doubt that for the XTERRA Tribe, the best part is that it signifies the start of XTERRA racing in the U.S. This Saturday, XTERRA Bluebonnet in Bryan, Texas and XTERRA REAL in Granite Bay, California serve as the first chance for South Central and West region athletes to begin earning points in pursuit of a regional championship (and the Maui spot that goes with it). On April 22nd, as the weather heats up in the southern states, the XTERRA Southeast region will kick into gear with XTERRA Myrtle Beach while the Atlantic region will follow on May 6th with XTERRA Jersey Devil in Barnegat, New Jersey. The XTERRA Northeast region joins the mix on June 6th with XTERRA French River in Oxford, Massachusetts, where the nation’s hardiest athletes show what they are made of after months of training through snow and ice. The Midwest region gets underway June 10th at Illinois Wilds in Hanna City while the much beloved XTERRA Lory announces the arrival of Mountain region racing on June 16th in Bellvue, Colorado. The season keeps rolling until the XTERRA USA/Pan America Championship in Ogden, Utah on September 15th and is punctuated by two championship races. XTERRA Oak Mountain in Pelham, Alabama on May 19th and XTERRA Beaver Creek in Avon, Colorado on July 21st feature some of the best trails in the country. Even better, they attract some of the best XTERRA athletes from all over the world. We know this season will go quickly, as it does every year, and we can’t wait to see what will unfold. We look forward to watching the races for regional championship titles and to see who earns a ticket to Maui by being the fastest on a given day at XTERRA Oak Mountain, XTERRA Beaver Creek, and XTERRA Nationals. However, the best part of the tour belongs to the athletes. Whether it’s the quiet fortitude of the Northeast warriors, the rambunctious shenanigans of the Southeast athletes, or the diehards in Texas, who eat points for breakfast, we salute the men and women who will bravely toe the line, suffer well, and finish strong in 2018. We have no doubt they will inspire us with their courage, grace under pressure – and because this is XTERRA – their camaraderie and kindness.